Everyone knows a baby's first Halloween costume is all about the parents (shh...don't tell). And why shouldn't it be? You've worked hard! All those sleepless nights, diaper changes, and crying tantrums—you've earned some extra joy in your life! That's why we think you should put your baby in whatever tickles your fancy this year. You have many years ahead to let your child costume themselves—this first trick-or-treating experience should please you, make the babe look adorable, and elicit oohs and ahhhs from all the neighbors! This Wizard of Oz Baby Dorothy Costume will do just that! 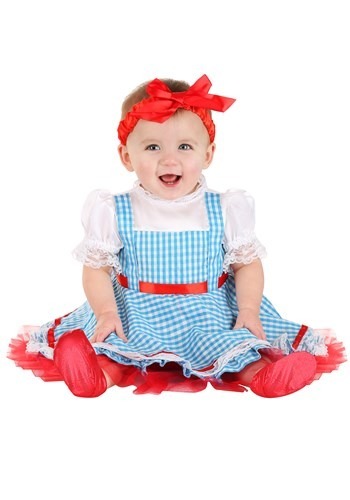 Dress the whole family in Wizard of Oz costumes and make her the star of the show (as if she wasn't already)—it doesn't matter that she's never seen your favorite film yet. You've been singing her "Somewhere Over the Rainbow" as a lullaby, and she'll look awfully cute next to your family dog as Toto! This is a licensed costume taken straight from the film—just in baby form. And if we've learned anything in this business, it's this: EVERYTHING is cuter when it's made for babies. Dragons, witches, grandpas, even tax collectors—all of these looks get cuter the smaller they are. And why should Dorothy be any different? This ensemble mimics her original look with its blue and white gingham pattern, white puff sleeves, and adorable red accents. Ruby slippers? More like ruby booties, but still, so cute! She may not be able to lift a pail of water or follow a yellow brick road, yet, but she's ready to steal the hearts of all those who meet her on her journey! At the end of her big night out, you'll all be excited to return home with your first Halloween memories. She's not old enough for nougat, so put her down for a rest and re-watch your favorite film as you enjoy the candy loot! Hopefully, she'll drift off as though she's in a field full of poppies.